Yesterland Presents an Urban Legend: Swan and Dolphin Reversed? Under the “Myths & Legends about Disney” heading on the Yesterland home page, there are now 18 articles. 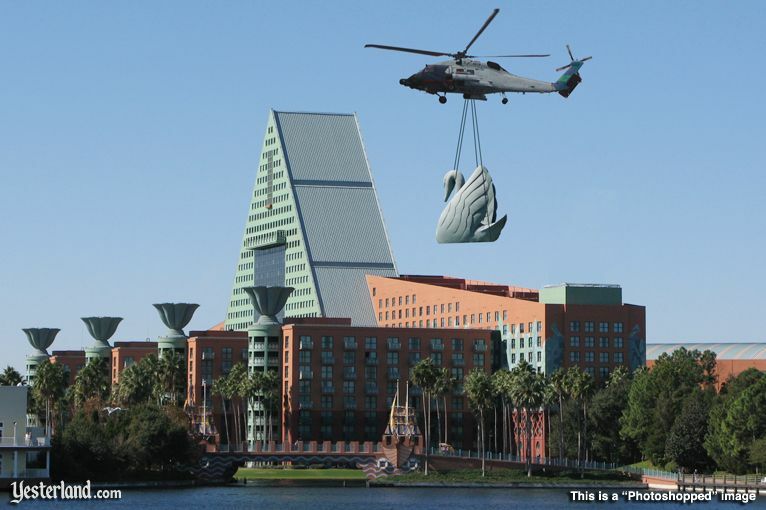 One of my favorite stories is about how a careless helicopter crew supposedly changed the Walt Disney World Swan and Dolphin forever. Legend: Take a careful look at the Walt Disney World Swan and Dolphin. The giant rooftop sculptures don’t match the paint schemes and ornaments. The swans are on the building with the ocean waves and seashells. The dolphins are on the building with the leaves and park-like fountains. That’s because a helicopter crew installed the sculptures on the wrong buildings. It would have been very costly to correct the mistake. Instead, the hotel company swapped the names. The Swan became the Dolphin and the Dolphin became the Swan. 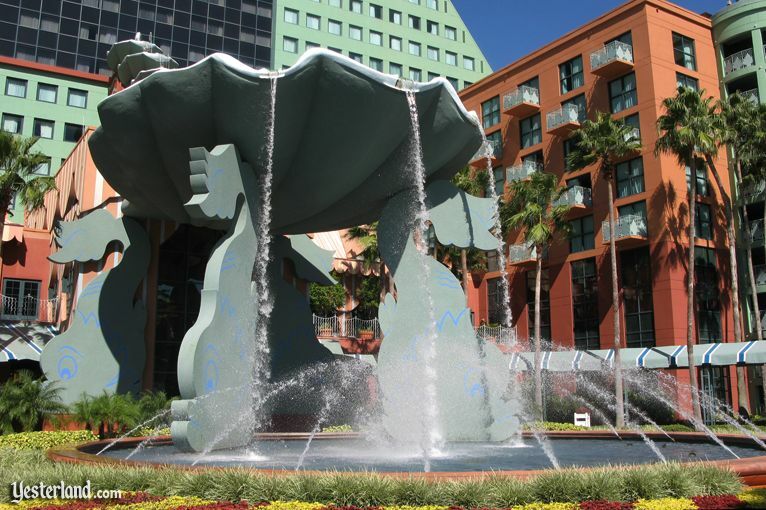 The Walt Disney World Swan and Dolphin hotels are known for their iconic sculptures. 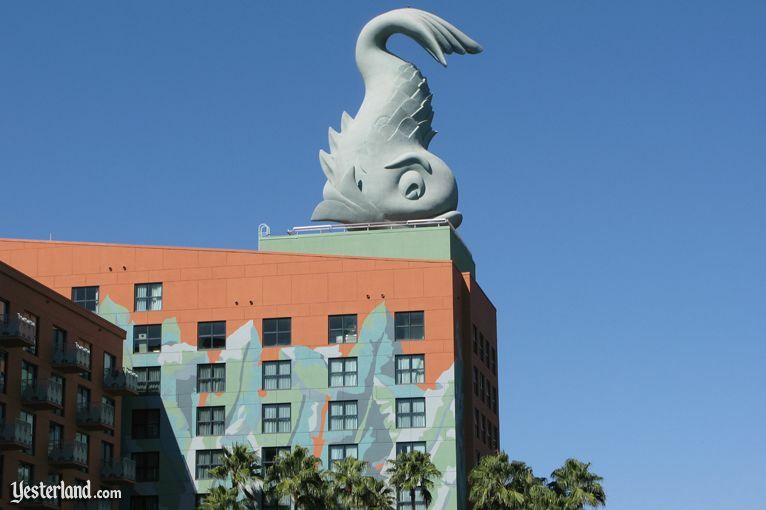 According to legend, the 47-foot-tall swan sculptures and 55-foot-tall dolphin sculptures were installed on the wrong hotel buildings—and the paint schemes provide the proof. 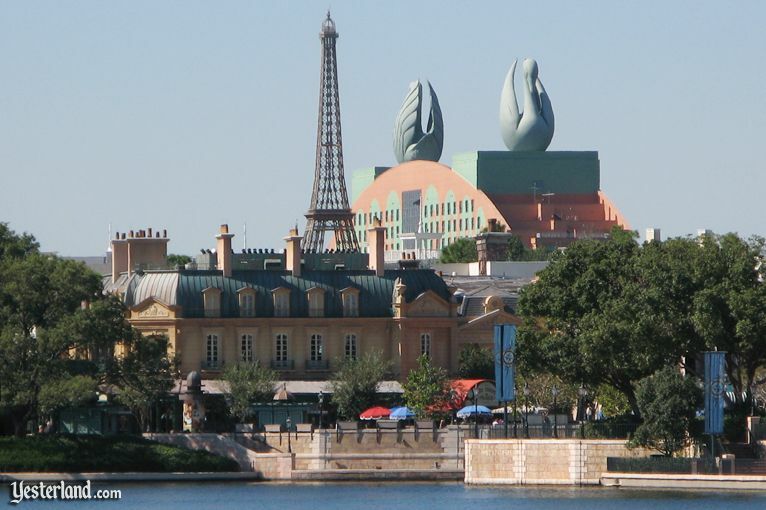 The truth is that the sculptures are exactly as postmodern architect Michael Graves intended. 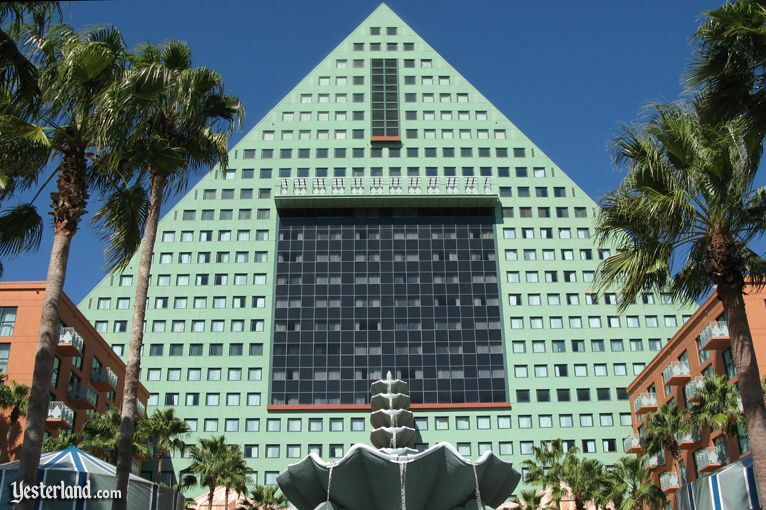 Although this huge convention hotel complex was never owned or operated by The Walt Disney Company, former Disney CEO Michael Eisner selected Graves to design the unusual hotels on Crescent Lake near Epcot. 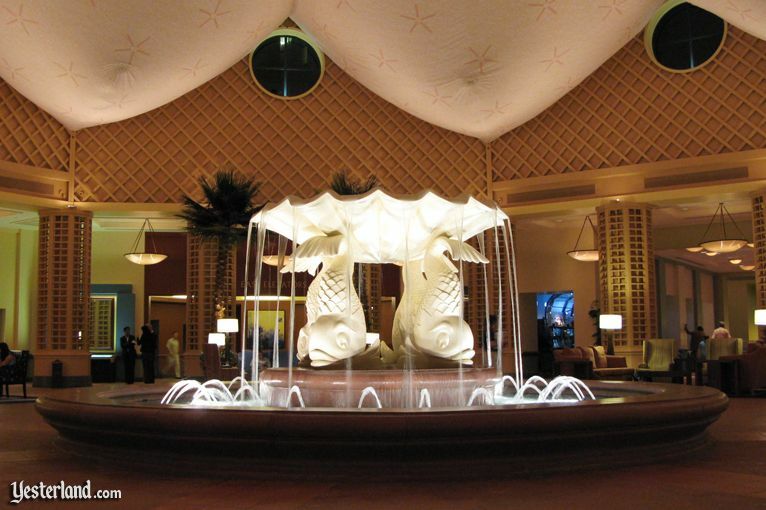 Two huge dolphin sculptures adorn the hotel with the banana leaf mural. Graves based his design on an elaborate storyline, but the story never made it into books or promotional materials. With the lack of published documentation, it’s challenging to make an irrefutable case that the legend about the switched sculptures is wrong. In her 1996 book, Building a Dream: The Art of Disney Architecture, author Beth Dunlop devotes 11 pages to the Walt Disney World Swan and Dolphin, without explaining why the Swan has ocean waves and the Dolphin has leaves. Sure, a construction mistake of the magnitude of switching the iconic sculptures would be unlikely, and it would be even more unlikely that it would not be corrected. But that still doesn’t explain the waves and leaves. Disney historian Jim Korkis knows the real story. He has written extensively about Disney history for decades in books, magazines and on websites and is well-known and respected in the Disney historical community. Jim has been called “The Smartest Man in the World” when it comes to Disney history. After you read the following conversation with Jim, you’ll see why. 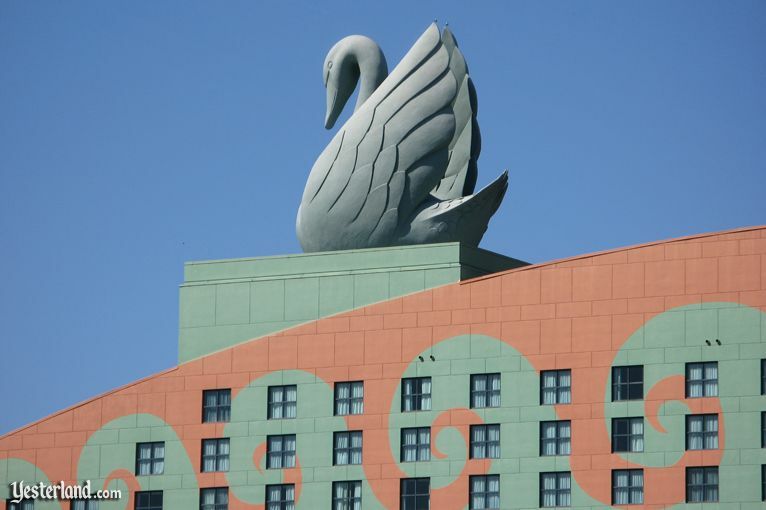 Two huge swan sculptures adorn the hotel with the ocean wave mural. Werner Weiss: I want to write an article refuting the urban legend that the giant Swan and Dolphin sculptures were erroneously switched during construction, so the names were switched. Do you have any documentation that I can cite? Jim Korkis: Some of the story of the Swan and Dolphin can be confirmed in the book, Everything By Design, by Alan Lapidus. He was the other architect who worked on the project, along with Michael Graves. Like too many stories at Walt Disney World, none of them were completely documented, or that documentation has been lost over the years. Fortunately, in 1996, I was an animation instructor at the Disney Institute and Graves came to talk about entertainment architecture at Disney. Later, several of us took Graves out for a drink or two at Seasons restaurant and he shared the story of the Swan and Dolphin. WW: Was that the old Seasons Dining Room and Lounge at the Disney Institute, where the Saratoga Springs Resort now has its restaurants? The swan sculptures look like stylized swans, but the dolphin sculptures look unusual. WW: What did you learn from Graves? JK: Michael Eisner was adamant that he did not want just “refrigerator box” style hotels on Disney property. He very much wanted everything built on Disney property to tell a story and pushed for Graves because he wanted the Disney Company to be known for using renowned architects. Graves had a love/hate relationship with the Disney culture. He freely admitted that seeing a four-foot mouse walking around in the parks was just “wrong” as far as he was concerned, and that he had no favorite Disney film. So when it came time to design the hotels, he steered clear of classic Disney imagery, preferring to create “new” characters that would then be folded into the Disney legacy. Perhaps his characters would even be the inspiration for Disney movies and merchandise. WW: So what’s the story? JK: His basic concept for the Dolphin was that it was an island formed by a sudden cataclysmic event—an upheaval by an underwater volcano or earthquake. When the island emerged from under the sea, it lifted dolphins out of the water, and these are the dolphins on the roof. The banana leaves on the side of the building are the tropical plants growing on the island. The mysterious “black box” was never intended for monorail usage; it was the heart of the island, which burst open from the sheer force of the events. Water went spilling down the outside of the building into that “dolphin fillet” [two-dimensional dolphin] pool, and then splashed over to the Swan. The railings and the curving landscape connecting the two hotels indicate waves moving from the Dolphin and splashing up along the side of the Swan. These are the waves that you see on the side of the Swan. Two swans were so entranced by this natural phenomenon that they alighted to watch it up close—and were turned to stone. WW: I know the dolphins are dolphin fish, not dolphins like Flipper, but Graves’ dolphin fish look a bit odd. JK: The dolphin image was inspired by the work of Italian sculptor Gian Lorenzo Bernini. 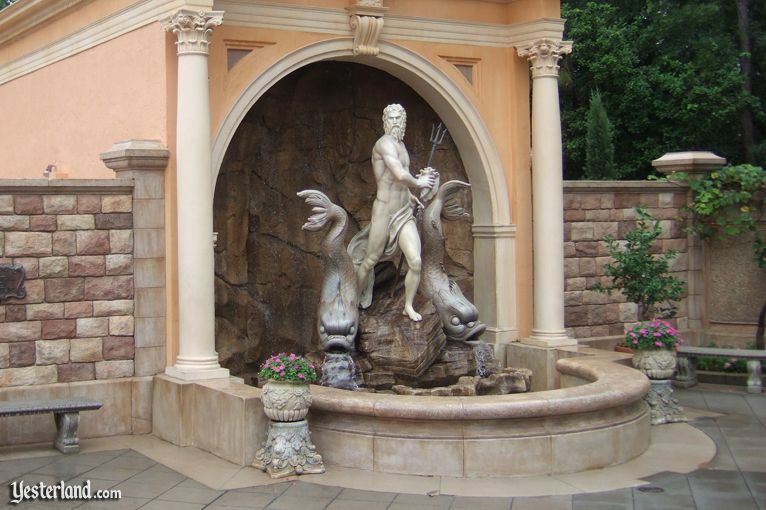 An example of Bernini’s dolphins can be seen in the King Neptune fountain at the Italy Pavilion at Epcot. However, there is a major difference that Graves pointed out to us. Bernini’s dolphins had mouths that curved downward, and Eisner insisted that wasn’t going to happen on Walt Disney World property—so Graves’ dolphins have their mouths curved upwards as if smiling. The mysterious black square on the Dolphin is not a removable section for a future monorail route. WW: Let’s go back to the black square. JK: That black box? In Graves’ original design—with just one side of the building sloping rather than both sides to create the pyramid effect—it was a somber sphere, half sunk into the middle. When he worked on the redesign, it made more sense for the sphere to become a box. The real secret is there was no practical way to make use of the last eighty feet of the pointy top, so fake windows were put on the outside—but there are no rooms up there. WW: Interesting! A lot of people think the black box has fake windows, but those windows are real. Yet the windows above it, which people think are real, are actually fake. Why the aquatic theme? JK: Graves felt it captured the world of Florida, although perhaps flamingos and manatees might have been a more appropriate choice. By the way, Graves and Lapidus did a lot of work on this project at the Beverly Hills Hotel in California which at the time had wallpaper decorated with giant banana leaves. WW: It’s odd that there seem to be more people who believe the urban legends about the Swan and Dolphin than who know the real story. JK: During my extensive research, I found that this storyline was never shared with the employees nor included in any training manual. It was passed along orally—Graves was well-known for entrancing Disney executives with his oral presentations. 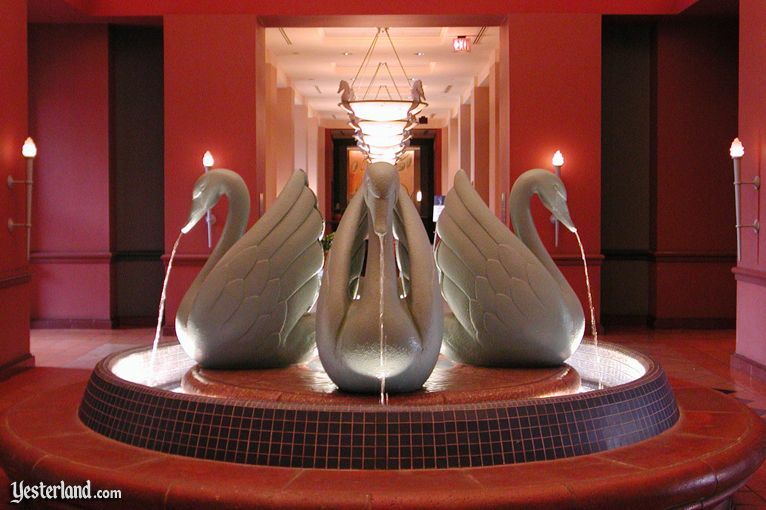 Guests can easily touch the three-dimensional swans in the lobby fountain. 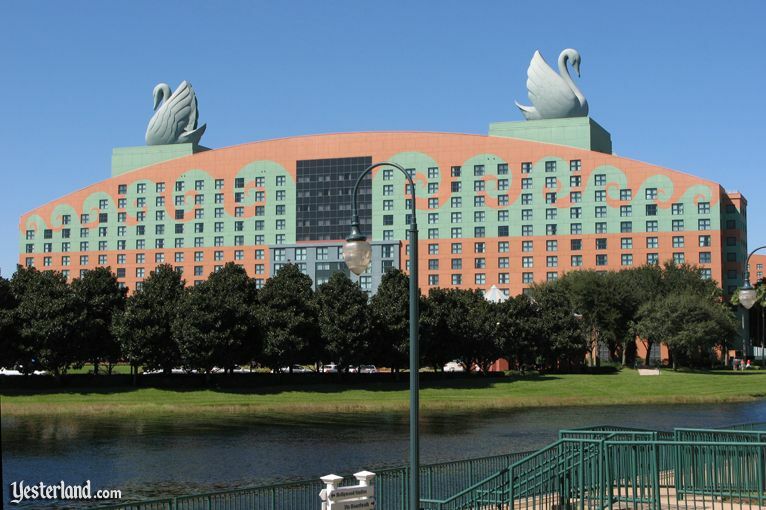 WW: Any other things that Yesterland readers might want to know about the Swan and Dolphin? JK: At the Dolphin, guests can only touch two-dimensional objects, with all the three-dimensional objects out of reach. But at the Swan, the two-dimensional objects like the monkeys cannot be touched by guests, while three-dimensional objects like the huge swans in a little, itty-bitty fountain near the check-in desk can be. 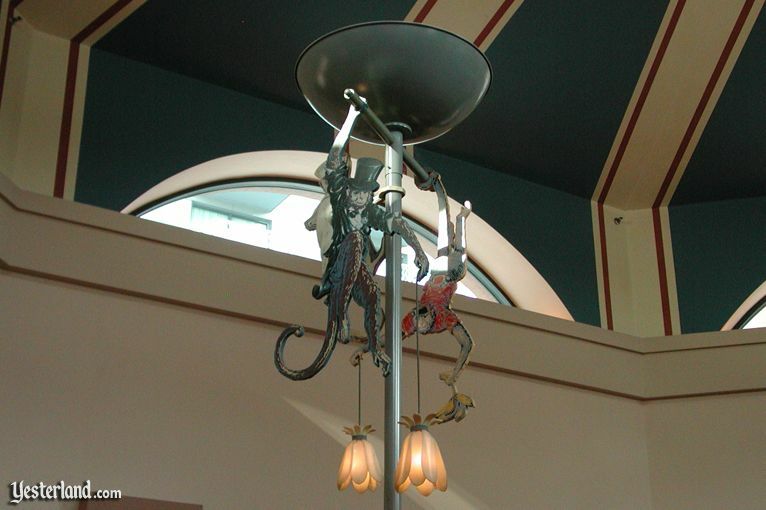 Light fixtures with two-dimensional monkeys at the Swan are out of reach. WW: I guess there’s a lot of logic to the design of the Swan and Dolphin, even if the backstory is far-fetched. JK: You need to realize that the story of the Swan and Dolphin that I’ve shared with you was readjusted in 2002 after a major interior redesign. Even though they brought in Michael Graves to help, there were changes to the interior that no longer support that original story. At one time, it was all cohesive… even if no one consciously understood what was going on. The Walt Disney World Swan and Dolphin can be seen from World Showcase at Epcot. WW: Thank you for all the great information! JK: Hope some of this helps. It’s important to document these things before they are lost forever. Already cast members, guests, and some websites are “filling in the gaps” with misinformation. It’s what my friends in Imagineering refer to as “logical erroneous conclusions.” Since the true story is not known and nature abhors a vacuum, people start jumping to assumptions that seem to make sense. Some inappropriate changes have been made in the parks and resorts over the years because even Disney itself doesn’t always know or understand the story that is being told, so will do things without realizing how it’s affecting the rest of the story.